Corey Yuen, as I’ve described in other reviews, is hit and miss with his American output. “Slumming it” has been a description I’ve given to some of his films. Here we are with Corey’s first American film as a director and his fourth film overall as director. Here he managed to do something that hasn’t been done since: he actually made JCVD, in his first role, look as if he could hang with the Hong Kong greats. For a little while. Let’s get this out of the way now: this film is terribly acted. I mean, community theater actors could do a way better job. This is Mystery Science Theater 3000 terrible. Having said that, the film still has a low -budget charm of its own. This film is known for the first appearance of JCVD, and there’s a reason why. He’s the only actor in the film who actually has a screen presence, even though he barely speaks. He takes over the film every time he appears, even though what little acting he does isn’t very good. The film’s story is okay, but nothing special. Kurt McKinney does a passable job as Jason, and Madison grates as J.W. , and the Russians, well, the more unsaid the better. Chung does a decent job impersonating Bruce Lee, even though he looks nothing at all like Bruce. The fights, particularly at the end, are the real attraction here. The only regret I have is that Peter Cunningham (Above the Law) doesn’t have a better fight with JCVD. Peter could have gone toe to toe with JCVD in a much longer and complex fight. 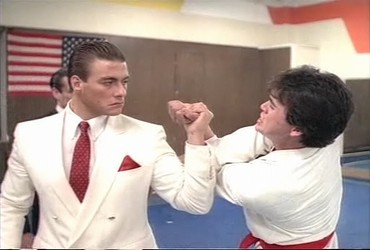 The next to last fight is between JCVD and Riley, the local dojo master. Now THAT was a great end fight, better than the fight between Jason and Ivan. 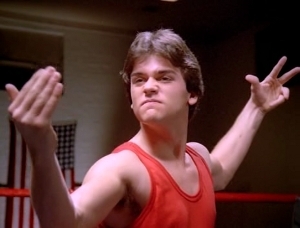 Corey brought his “A” game to that fight, and made JCVD look like an all-world martial artist (As most of you know I’ve had my issues in regards to how good JCVD is as a pure martial-artist, but I’ve always admired him nevertheless, for his “want-to” as much as anything else.). The final fight between Jason and Ivan has some good moments, but is far too short, shorter than the previous fight, which is puzzling. Corey Yuen isn’t “slumming” it here! However, the film is so poorly acted and edited you may find yourself fast forwarding to the end fights to see JCVD let loose for the first time. NEXT: I’m not done with Corey Yuen just yet! He returns as fight choreographer for Jet Li’s newest: Badges of Fury!